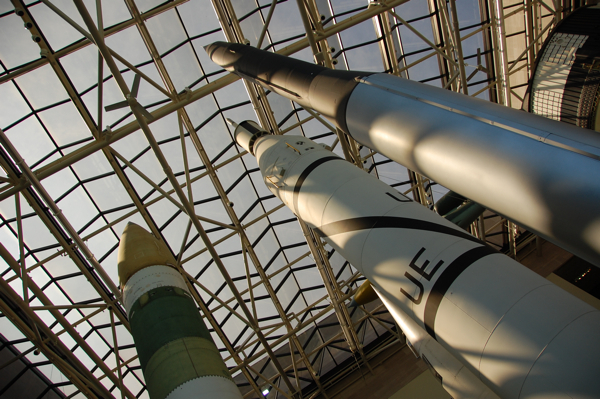 Big rockets reach for the skylights at the National Air and Space Museum. 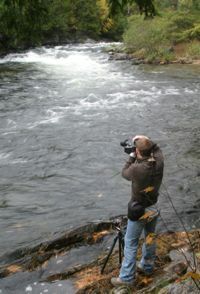 As long as you have friends in the city, Washington is one of the cheapest places to be a tourist. Without the cost of a hotel, tourists save money visiting the free Smithsonian museums and, if they're like me, just appreciating the architecture and nature beauty of the District. I'll admit that I'm more of a fan of the outdoor attractions, though. I appreciate history, but I get restless, tired, bored in static museums that have little to engage the senses. That's why, by the way, the Newseum's eclectic offering of multimedia is no snoozer. But before my visit to journalism's historical icon on Day 3 of my D.C. trip, I checked out one of Washington's more traditional venues: the National Air and Space Museum. I went to the place only because of my renewed interest in the space industry. When I was young, I would go to school in a blue astronaut flight suit. I very much wanted to visit the space station via the shuttle some day. And I was very lucky that I didn't get teased. But my interests propelled me into the journalism field, where I now work at a newspaper with great focus on a dominant player in the local economy: NASA. 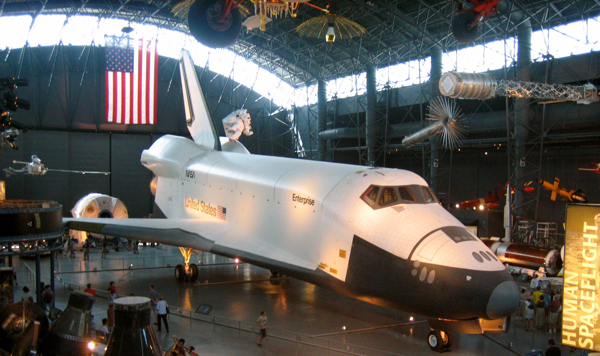 In a photo from the archives, the shuttle Enterprise at the Udvar-Hazy Center at Dulles International. So my visit to the museum on the National Mall was more informed than it would have been last year. When I lived in Washington, I did visit the Udvar-Hazy Center at Dulles International Airport in Virginia, a satellite extension of the building on the mall. At Dulles, the Enterprise test shuttle was the most stunning exhibit, above. You really appreciate the size of the orbiter when you're standing beside it: It's not just that glowing streak on the horizon as you watch the shuttle lift off. 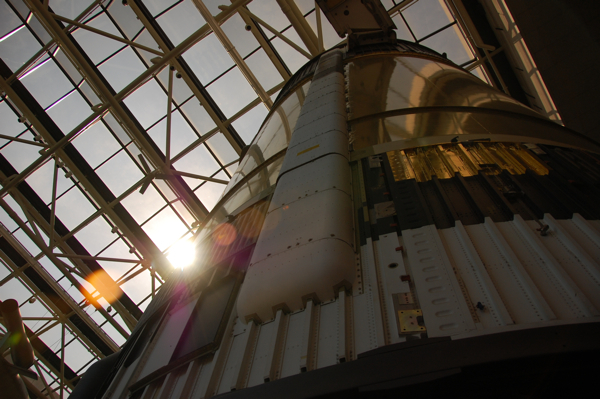 The only drawback to the Air and Space Museum is that the exhibits tend to draw more of the younger sect. Big planes and rockets are decidedly more fascinating to children than a Van Gogh or a bust of Thomas Jefferson. They scream to let you know they're excited. 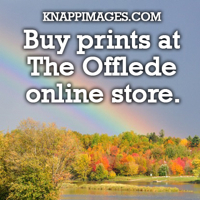 But really, it's not so bad: We're all kids when we visit a place like this. My trip through the museum was hurried because I had a meeting to make at the Newseum later Monday. But these are a couple of the things that did grab my attention. 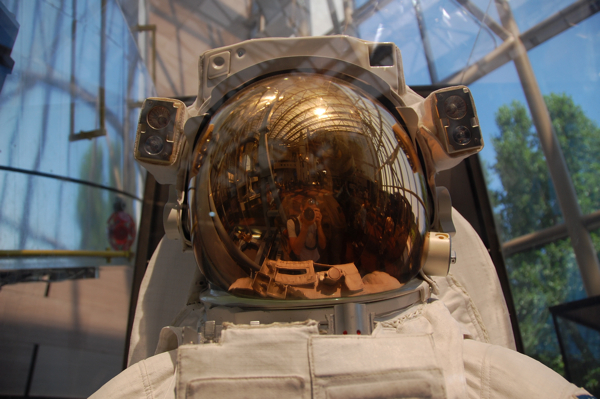 During every shuttle mission, seemingly, there's a spacewalk in which an astronaut has his picture taken. But you can't see his face in the photo, of course, only the reflection of the space station, the Earth and the camera lens. This is my version of that photo here on terra firma. This is Skylab, the first space station, which was used for scientific testing starting in 1973. 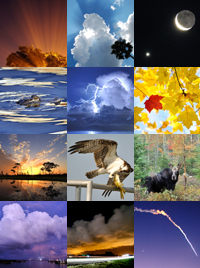 It confirmed that humans could stay in zero gravity for extended time periods. 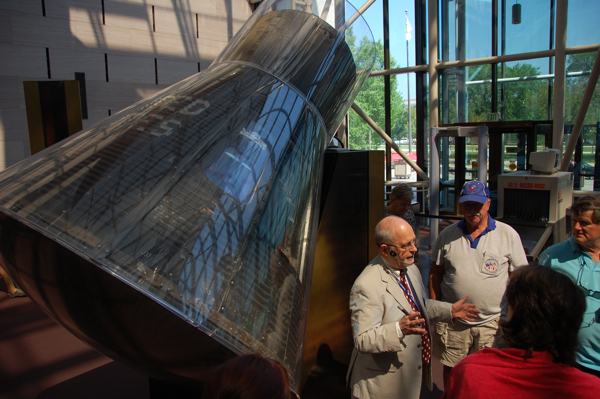 A tour guide explains the Mercury Friendship 7, which first brought man - specifically, John Glenn - to Earth orbit in February 1962, about 10 months after the Russians beat us to it. Yes, this is just a mural. But there's a story behind, not this one, but the one at FLORIDA TODAY. 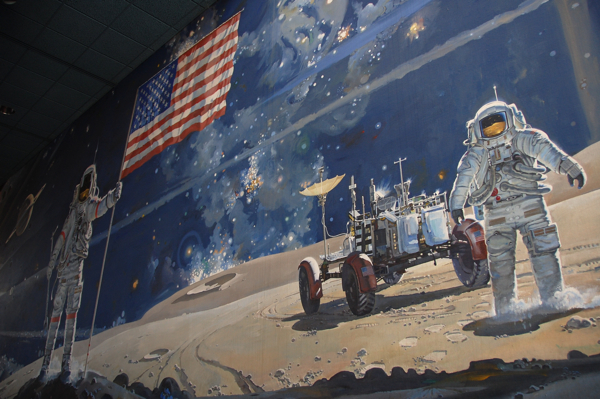 In the main lobby of my newspaper's building, a similar painting of a lunar landing graces the wall. But in that painting, there are three astronauts hopping over the desolation of the moon's surface. In this one, there are only two. What's the big deal? There were never more than two people moonwalking at the same time. The FLORIDA TODAY version is incorrect. 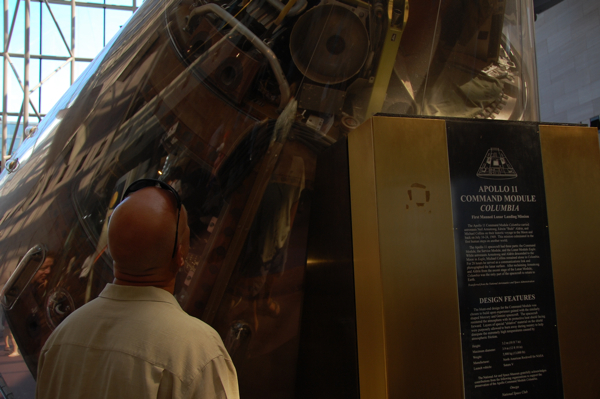 This museum-goer is marveling at the innards of the Apollo 11 command module, part of the mission that sent man to the moon for the first time. I can't wait until we go there again.